The guide books recommended Seri Menanti Royal Museum as a place to visit just two hours drive from Kuala Lumpur so one weekend I took the family for a look-see. The small town of Seri Menanti is the royal capital of Negri Sembilan state (Seremban is the state capital). Negri Sembilan translates as nine states reflecting the historical 9 fiefdoms which made up the confederation from 1773 onwards. 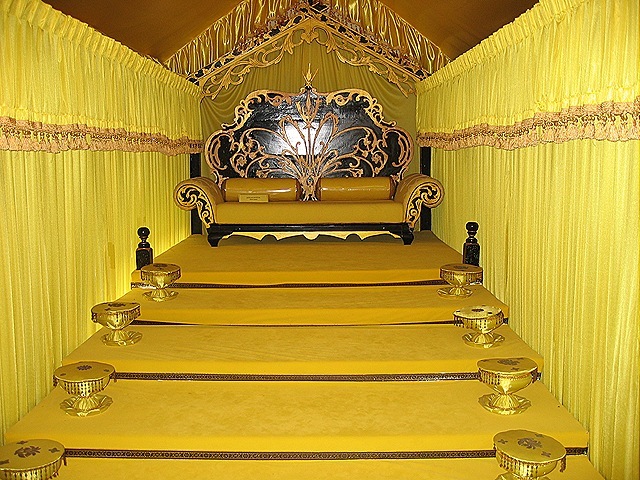 The rulers of this state are of Minangkabau stock having migrated from western Sumatra about six centuries ago bringing their distinctive architectural style with them. This building was constructed between 1902 and 1908 as a royal palace to replace an earlier one which was destroyed by the British in 1875. The most famous fact about this four storey structure is that it was apparently built without the use of a single nail. 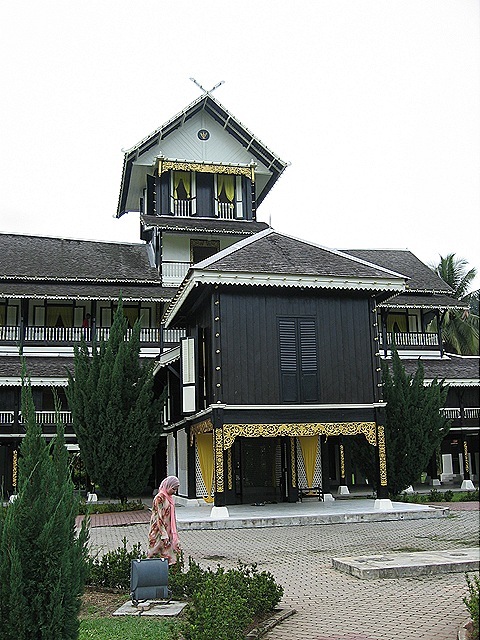 It served as the official residence of the Negri Sembilan royal family until 1931. It was made into a museum of royal regalia in 1992 and contains displays of costumes, weapons, furniture and other paraphernalia. The town itself is home to the Royal Seri Menanti Golf & Country Club which is surrounded by three palaces including the current official residence of the ruler of Negri Sembilan. There is also a Royal Mausoleum, Royal Mosque and a hotel. It was a pleasant day out and worth the visit.